Lisnagarvey are losing three of their star players as the drain on men's international talent to either mainland Britain or to Europe increases dramatically over the close season. The introduction of a fully fledged Irish Hockey League three years ago was to help attract back international players from abroad, but this has not happened, for there will be an astonishing 20 no longer playing domestically. The attractions are obvious, salaries beginning at £30,000 augmented by coaching fees. Many of those moving away are from across the border, but Ulster has also felt the pinch with Garvey, who failed to qualify for Europe, now finding themselves without defender Paul Gleghorne and midfielders Sean Murray and Neal Glassey. Gleghorne and Glassey are off to Crefelder, where Banbridge's Matthew Bell has already a season under his belt at the German club, while Murray is heading to Rotterdam with Pembroke keeper Mark Ingram. Pembroke, in fact, are also losing striker Alan Sothern and midfielder Kirk Shimmins to Belgian clubs, and also heading to Belgium are Monkstown's Stephen Cole and Lee Cole. So too is Shane O'Donoghue, the inspiration behind Glenanne's IHL title win, while striker Jeremy Duncan already plays his hockey in that country, taking the number of Irish internationals there to eight. The Harte twins, David and Conor, are already based in Holland and Belgium respectively, while Ulster duo John Jackson and Chris Cargo are in England along with Stuart Loughrey. If you count Ronan Gormley, Maurice Elliott and Brian Doherty, who have featured for Ireland in the past, that takes the total to 20 internationals now playing abroad and just over ten still with domestic clubs. So why has the IHL not managed to hold onto their stars? The pull for the players is two-fold - they can play professionally abroad and they can also obtain a higher grade of competition as they bid to claim a place in the final Green Machine squad of 18 who head off to India in November for the World Cup finals. Lack of finance and sponsorship means Hockey Ireland aren't yet in a position to offer centralised contracts like rugby, while domestic clubs can ill afford to ply players either. Heading off to Europe on full-time contracts is too big a lure, and playing alongside many hockey legends gives the Irish players a chance to improve ahead of the world finals. With the IHL now somewhat diluted, it doesn't seem the best time to start a Second Division, but that's what will happen in September when the new IHL2 is launched. Stand by for some of those already qualified for the IHL2 to find themselves losing players too as the top clubs take steps to fill the gaps. Meanwhile, both the Irish men and women will be in action twice over the next few days. The women take on Chile tomorrow at UCD (6pm) as they continue their build-up to the World Cup finals in London next month, and that game will be followed by the men taking on the USA (8pm). The men play the USA again on Friday at Pembroke's Serpentine Avenue ground (7pm) while the women take on Italy on Saturday, also at Pembroke (2pm). Men's assistant coaches Jonny Caren, John Bessel and Kai de Jager have chosen a squad of 21, giving some of the fringe players a chance to stake a claim. Missing are David Harte, Conor Harte, Matthew Bell, Chris Cargo, Johnny Jackson, Kirk Shimmins and Neal Glassey, but getting a run-out will be Luke Madeley, Stephen Cole, Lee Cole, Daragh Walsh and Sam O'Connor. There are eight from Ulster in the men's squad and six from Ulster in the women's squad. IRELAND MEN: Jamie Carr, David Fitzgerald, Mark Ingram, Eugene Magee, Owen Magee, Mitch Darling, Johnny McKee, Matthew Nelson, Jeremy Duncan, Alan Sothern, Shane O'Donoghue, Michael Robson, Sean Murray, Daragh Walsh, Stephen Cole, Luke Madeley, Paul Gleghorne, Jonathan Bell, Stuart Loughrey, Lee Cole, Sam O'Connor. By John Flack Australian Sean Dancer has been named as the new head coach of the Irish senior women's team to succeed Graham Shaw. By John Flack Ards will be without experienced defender Naomi Grundie for Saturday's win or bust EY Irish Hockey League away clash with Cork Harlequins. 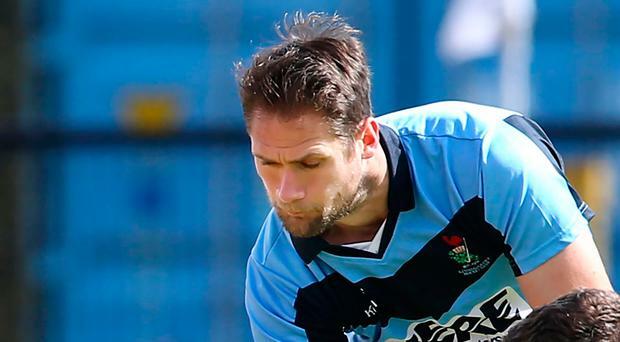 By Graham Hamilton Cookstown are remaining upbeat for Saturday's final throw of the dice to avoid relegation from the EY Irish Hockey League despite last night's Anderson Cup semi-final defeat.